Whilst many disruptive influences have created challenging business conditions for legal firms in Australia, technology disruption now has a greater potential to make an impact on the industry in a profound and positive way. Automation we know can take care of the boring repetitive tasks at a fraction of the cost, however the latest technology innovation is customer-centric, highly innovative and can boost the bottom line. Legal research has come a long way. From the early days of leather-bound books to today’s digital search solutions, legal content is now even easier to find courtesy of how we have shaped our own interaction with search engines. Digital transformation is the number one thing keeping lawyers awake at night, according to the Wolters Kluwer Legal Trends Survey 2018 (WK Legal Trends). Forty percent of those firms surveyed believe this will be their number one challenge over the next three years. Applying this new digital technology, finding new clients and increasing billable hours were also high priorities for firms. Rounding out this list from WK Legal Trends respondents was keeping up to date. Interestingly with many firms also confirming plans to specialise, the need for in-depth and accurate content is more important than ever. For Wolters Kluwer the accuracy and relevance of legal research underpins every firm. “Service proposition is changing for firms and this is seeing boutique firms build their reputation as practice specialists. It goes without saying accurate, in-depth and easy-to-find content can help improve client relationships and enable new services,” outlined Lauren Ma, Regional Director - Knowledge Solutions, Wolters Kluwer. The modern search experience is based on the need to enhance three key elements necessary for successful research – findability, searchability and usability. Enhancing these three key elements removes any ambiguity from the search process and creates an ideal starting point for legal practitioners. 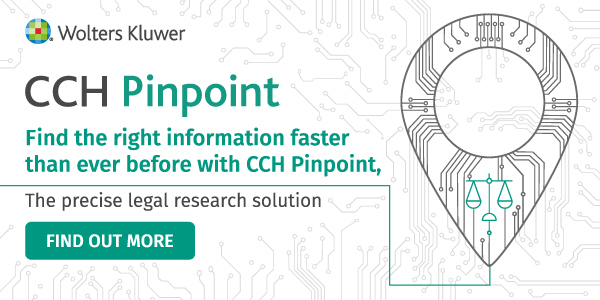 The latest legal research offering from Wolters Kluwer, CCH Pinpoint is an accurate online research solution that presents information in a practice area specific homepage. “CCH Pinpoint early adopters are unanimous. They appreciated the practice area-focused curation of information as an ideal starting point for any search. By focusing search on a single practice area at a time we cut out a large element of distraction without the need to compromise on having the breadth of content in the solution. CCH Pinpoint offers the flexibility to search across multiple practice areas when required,” said Ma. CCH Pinpoint now offers a 360-degree view of key legislation, introducing a greater level of value for the content at hand. “Accessing information from a 360-degree perspective delivers the type of value legal firms are looking for with their research solutions. They want to see the related content relevant to a particular section and firms familiar with our latest solution love the snapshot of helpful content,” continued Ma. New practice topic guides are also part of the new look CCH Pinpoint research solution. These topic guides direct the user through a step-by-step big picture view for any topic, helping users to increase their knowledge on a subject without slowing them down. “There is an overwhelming efficiency benefit per use when users can search our expert content and tools to find all of the possible answers without any interruption to their research workflow. And if they want to switch topic areas they can, it’s so flexible all it takes is one click,” noted Ma. Australia’s largest aggregator of legislation and legal cases, Austlii is used by the majority of firms in practice today. However, in the WK Legal Trends survey respondents emphatically confirmed freely available content and news from social media networks did not fulfil legal research needs. CCH Pinpoint provides access to content, practical tools and precedents from one of the world’s leading legal industry knowledge and solutions expert. Combining the strength of its renowned Australian legal editorial team with its international designer and developer community, CCH Pinpoint is part of the continued focus customer-centric innovation and mix of digital and expert solutions Wolters Kluwer is delivering around the world.